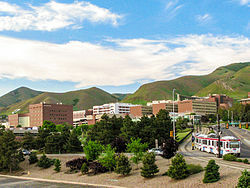 The University of Utah Hospital is a research and teaching hospital on the campus of the University of Utah in Salt Lake City, Utah. It serves as a major regional referral center for Utah and the surrounding states of Idaho, Nevada, Wyoming, Montana and New Mexico. University of Utah Health Care is praised for the following specialties: cardiology, geriatrics, gynecology, pediatrics, rheumatology, pulmonology, neurology, oncology, orthopedics, and ophthalmology. In 1965, the hospital, today housing clinics and the School of Medicine, opened its doors. In 1982, Barney Clark received the world's first permanently implanted artificial heart, the Jarvik-7, during an operation performed by William C. DeVries, M.D. In September 1981, an expansion to the old building was dedicated. In 2001 the hospital was named as the Intermountain West's first nationally certified Level 1 Trauma Center by the American College of Surgeons. In 2007 the George S. and Dolores Dore Eccles Critical Care Pavilion, an addition to the hospital was opened. A new $200-million patient care pavilion, with space for an additional 100 private patient rooms, was dedicated in July 2009. Mario R. Capecchi, Ph.D. won the 2007 Nobel Prize in Physiology or Medicine as a University of Utah gene targeting pioneer. In July 2017, the hospital was part of an incident where the police detective Jeff Payne arrested the nurse Alex Wubbels. Payne asked Wubbels to provide a blood sample from an unconscious patient, and she was arrested when she refused. Wubbels was later released and no charges were brought against her. In September 2017, after footage of the incident went viral, the hospital announced changes to the hospital protocol meant to stop a similar incident from happening in the future. Under this new protocol, police officers will not be allowed in patient-care areas and will speak with "house supervisors" instead of nurses. The University of Utah Health Sciences medical campus. As part of that system, University Hospitals & Clinics relies on more than 1,100 board-certified physicians, 10 community clinics, and several specialty centers, including the Cardiovascular Center, the Clinical Neurosciences Center, and the Utah Diabetes Center. ^ "A Century of Brilliance: Milestones". University of Utah. Retrieved 2010-08-02. ^ Manson, Pamela (August 31, 2017). "Video shows Utah nurse screaming, being handcuffed after refusing to take blood from unconscious victim". The Salt Lake Tribune. Retrieved September 6, 2017. ^ Reavy, Pat (August 31, 2017). "'Stop! I've done nothing wrong': Nurse shares police video of 'crazy' arrest by S.L. officer". Deseret News. Retrieved September 6, 2017. ^ Barbash, Fred; Hawkins, Derek (September 5, 2017). "Utah hospital to police: Stay away from our nurses". The Washington Post. Retrieved September 6, 2017.